Home/Persuasive Litigator (Persuasion Strategies)/Ask Your Potential Juror: Having an Epistemological Crisis? People have always believed things that aren’t true: The earth is flat, nonconforming women are witches, the moon landing was faked. 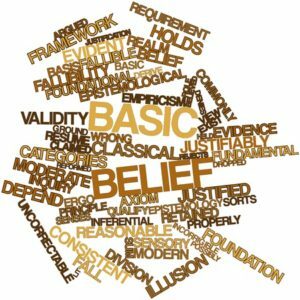 Currently, we have our own set of false beliefs that have permeated some sectors of society. The difference, perhaps, is that there’s now the feeling that we’re in a unique phase: It is not just that some cling to false beliefs, it is that the mechanisms for correcting those beliefs, or for arriving at beliefs in the first place, are breaking down. A recent Rush Limbaugh program provides a good example: Using a flashy designed graphic, he laid out what he called the “Four Corners of Deceit,” which include, “academia, the media, government, and science.” So what does that leave? Just religion and the beliefs of your ideological tribe, perhaps? Epistemology itself, the way we know what we know, is what’s breaking down. The Rush Limbaugh example comes from Vox article last month by David Roberts, focusing on the provocative question, “What if Mueller proves his case and it doesn’t matter?” Of course, we could also ask the flip side of that question about the special prosecutor looking into Trump campaign collusion with Russia: “What if Mueller exonerates the campaign and it doesn’t matter?” According to Roberts’ analysis, we’ve gotten to this point due to a “tribal epistemology,” or “the systematic conflation of what is true with what is good for the tribe.” Roberts focuses on it as a right-wing phenomena, but of course, there are also examples on the left. Whatever the political stripe, it matters for the potential juror, raising the question of how open-minded or how “tribal” they’re going to be in applying their attitudes to the case at hand. “The only way to settle any argument is for both sides to be committed, at least to some degree, to shared standards of evidence and accuracy, and to place a measure of shared trust in institutions meant to vouchsafe evidence and accuracy,” Roberts writes, “Without that basic agreement, without common arbiters, there can be no end to dispute.” So that’s a reason for testing the open-mindedness of potential jurors and the extent to which this epistemic crisis might influence the pool. In the rest of this post, I’ll share a few questions for oral voir dire or supplemental juror questionnaire that get at that broad epistemic question. Open-ended questions are often good in order to get jurors talking and see their unmediated response, while questions that offer a range of responses (from strong to weak support or opposition, for example) are more useful for sorting those jurors into groups based on risk. Some questions are drawn from surveys I’ve reviewed, while others are brainstormed. The degree to which these questions will be allowed will vary based on the preferences of your adversary and your judge, but for this list, I’ll err on the side of being more complete. What are your most-trusted sources of Information? In the past twenty-four hours, which of the following networks have you watched? In the past twenty-four hours, which of the following written news sources have you read or visited? Do you have a Facebook Account? How often do you visit that account? How often does the news you read come from the “Newsfeed” in your Facebook Account? How often do you review information from a source that you disagree with politically? When it comes to forming your own beliefs, do you tend to rely on external information or on your own feelings? How often do you conduct research before making an important decision? Which statement best describes you: “Facts guide my life” or “Beliefs guide my life”? If you believe something really strongly, to what extent do you feel that you need facts to support it. Do you often, sometimes, rarely, or never change your views in response to new information? Which is more likely to shape your views on current events: What you read in news and other articles, or what you hear from the people you know? Thinking about the people you know and interact with on a regular basis, would you estimate that few, most, or nearly all of them agree with you on the most important issues? To what extent do you feel more secure in a belief knowing that most of your friends and associates also believe the same thing? Do you agree or disagree with the statement, “I trust my friends more than the media”? When it comes to receiving information on current events, to what extent are you concerned about bias? Do you agree or disagree with the statement, “All information is biased”? Do you agree or disagree with the statement, “Most ‘facts’ are really just opinions”? Do you agree or disagree with the statement, “It is almost always possible to find facts to support just about any view”?